Poor timing was redefined in Washington on Wednesday. During her testimony at a congressional hearing regarding the "debacle" of the HealthCare.gov launch, Health Secretary Kathleen Sebelius said that while she acknowledges serious problems with the site, it "has never crashed. It is functional, but at a very slow speed and very low reliability, and has continued to function." Rep. Marsha Blackburn, R-Tenn., said, "Let's put the screenshot up," referring to an image of the offline site that reads, "The system is down at the moment." BLACKBURN: I want to go to the cost of the website and talk about the website. This is what is happening right now with the website. We've had somebody in the back trying to sign on. It is down. It is not working. Last week I asked for the cost from each of the contractors that were with us last week. So can you give me a ballpark on what you have spent on this website that does not work, that individuals cannot get to? What is your cost estimate? 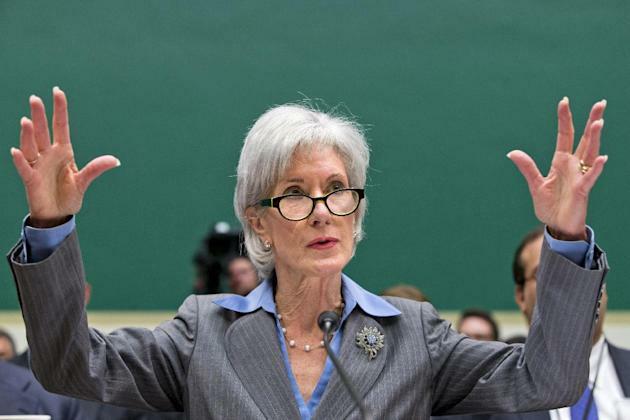 SEBELIUS: So far, Congresswoman, we have spent about $118 million on the website itself, and about $56 million has been expended on other IT to support the web. BLACKBURN: OK. Would you submit a detailed accounting of exactly what has been spent? And when do you expect constituents to stop getting these kind of error messages? One can argue about the differences between an outage and a crash and what it means when a website is "down," but for many, a crashed website simply means it's inaccessible. During a key moment of Sebelius's testimony, that's what the site was. The health secretary's rough day is quickly becoming the subject of GIFs and memes. One enterprising fan of the political process even put together a 15-second montage of Sebelius's morning up on Instagram.